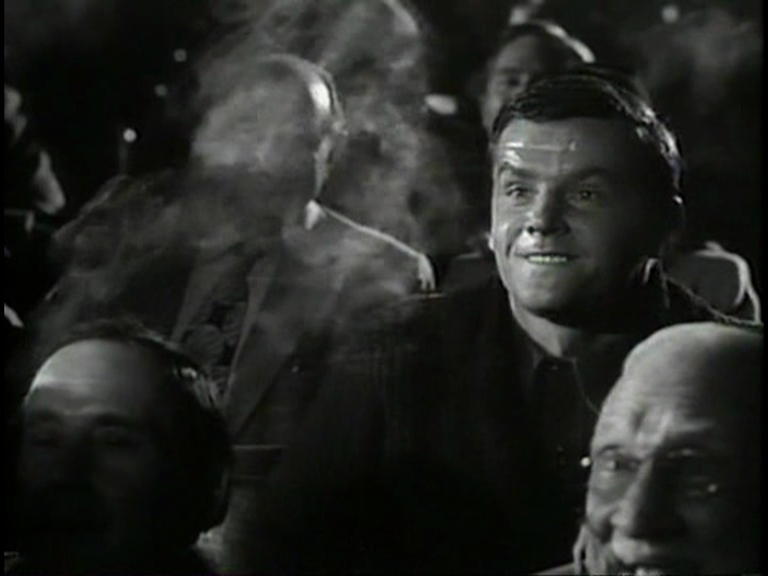 A laid-back Walbrook in the original film of GASLIGHT. Chiseled here. My main purpose here is to alert anyone who still needs alerting to the great event of the film blogging calendar, For The Love of Film, the film preservation blogathon, hosyed by Ferdy on Film, This Island Rod and the Self-Styled Siren. We raise money, we get a free streaming version of THE WHITE SHADOW, scripted by Alfred Hitchcock, directed by Graham Cutts, and we get an original score to go with it. Graham Cutts was one of the annoying lesser minds Hitchcock banged up against during his early years, a company which also included several producers and studio heads. And that’s how he is chiefly remembered. Hitch and Alma attempted to direct THE WHITE SHADOW by remote control, pointing out shots to the director, helping him along but also incurring his resentment. Still, Cutts did enjoy some success apart from Hitch, most of it via the series of films he directed with Ivor Novello — THE RAT, TRIUMPH OF THE RAT and RETURN OF THE RAT. Novello, apart from his charming songs, is best remembered today for THE LODGER, Hitch’s first real thriller, hit, minor masterpiece. He was a heart-throb and matinee idol, and although Hitch was prevented from casting him as a serial killer, he tended to write bad-boy roles for himself, albeit with a last-reel redemption — in this sense, the ultimate revelation of his innocence in THE LODGER is quite in keeping with the kind of role he was associated with. In THE RAT, Novello plays a Montmartre cat burglar entrusted with his devoted young ward daughter Odile (Mae Marsh), who falls in love with sophisticated rich lady Zelie de Chaumet (Isabel Jeans). The Rat finds himself in over his head, especially as his young ward faces a murder rap. Finding in himself a strange form of gallantry, he confesses to the crime — now only Zelie can save him. Cutts serves this up with a cinematic flair which puts the lie to Hitch and Alma’s claim that he was visually illiterate — unless he had someone else in Hitch’s place, helping him along, this time. THE RAT is a corking melodrama, and it not only merited two sequels but a remake in 1937. By then, Novello was out of movies for good, his strong Welsh valleys accent apparently considered unsuitable — in his few talkies, he tends to be cast as Eastern European or otherwise foreign, in hopes that his unfamiliar yet musical delivery could be disguised as exotic (not that I’m saying Wales is NOT exotic, you understand. Heaven forbid). So the role went to (drum roll)… Anton Walbrook, a true exotic. Doesn’t this image make you very happy and excited? It does me. Adding to the excitement, Odile is played waif specialist Rene Ray from THE PASSING OF THE THIRD FLOOR BACK (who also wrote THE STRANGE WORLD OF PLANET X, intriguingly) and Zelie is embodied by Ruth Chatterton, visiting Britain as part of her downward career spiral. All three actors are ideally cast and excellent, and if director Jack Raymond doesn’t have quite the expressionist chops to paint a really memorable Montmartre demi-monde, he doesn’t do badly. THE RAT is a fun character, though perhaps not suited to sequels (how many times CAN you be redeemed?) — really, there should have been a Hammer remake in the fifties, and maybe a Woodfall one in the ‘sixties in the wake of TOM JONES. Instead, British cinema dropped the ball and this character has fallen into disuse, slipping out of the public memory until there’s no longer any commercial value in bringing him back. Alas for The Rat! The silent RAT has one thing the talkie inexplicably omits — a bar called The White Coffin, where all the doorways are coffin-shaped and all the floozies carry a torch for Novello. So, according to my calendar, one week after the vernal equinox announced the coming of Spring, we have the start of British Summertime (a contradiction in terms if I ever heard one). I never knew Spring was only a week long, but now that I do, it kind of makes sense. To celebrate a Summer that isn’t a Summer, we have an intertitle that isn’t an intertitle. For Arthur Robison’s WARNING SHADOWS is title-free, apart from the opening credits. Above, we see how they signify the start of Act III. Now, a silent without intertitles is like a day without sunshine to me — even THE LAST LAUGH has one. But, on the other hand, the fewer the titles, the more effective the cinematic storytelling — or the simpler the story. An overwrought Fritz Kortner smashes his mirror, an action Robison liked so much he gave it to Anton Walbrook in THE STUDENT OF PRAGUE — who repeated it in THE RED SHOES.. WARNING SHADOWS actually has a rather sophisticated narrative, disguised as a straightforward one. The “nocturnal hallucination” structure goes well beyond the usual “it-was-all-a-dream” bookends in terms of ambiguity, resonance and meta-narrative allusiveness. The sinister shadow-puppeteer, at once Hoffmannesque and reminiscent of the creepy cobbler in THE RED SHOES, is an obvious stand-in for the filmmaker himself, presenting a cautionary fable with such artistry that we all mistake it for reality. The film is subtitled “A NOCTURNAL HALLUCINATION” — and they don’t mean this bit! 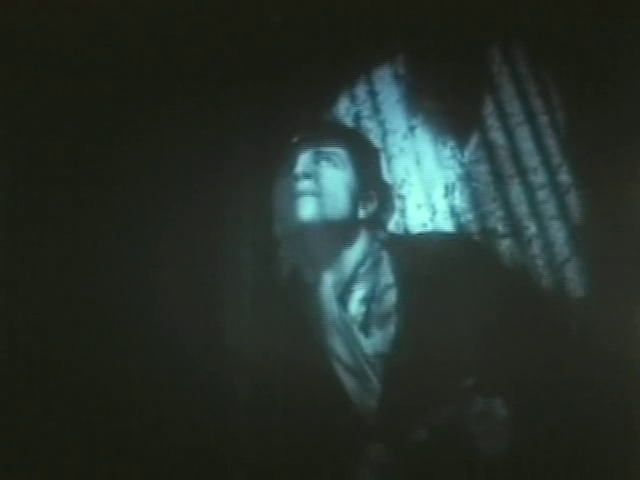 Robison seems an interesting guy — an American who became an archetypal German expressionist filmmaker, with both this and the sound version of THE STUDENT OF PRAGUE starring Anton Walbrook. Also a British version of THE INFORMER with Lars Hanson an unlikely Irishman. Further study is warranted. 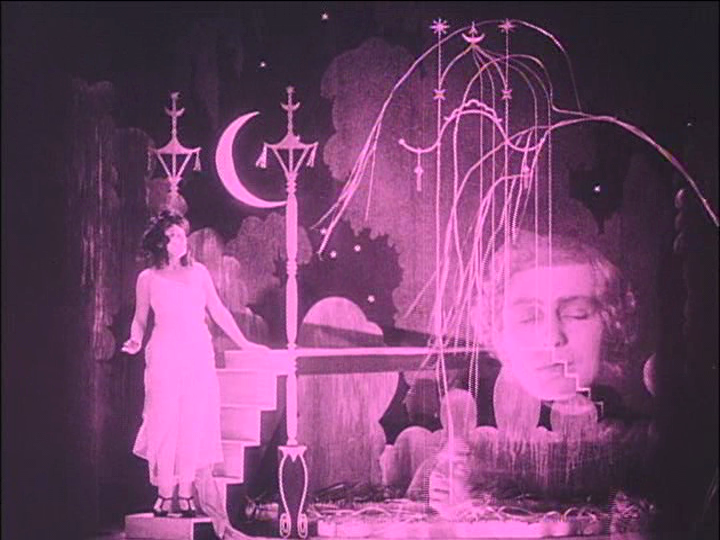 Here, he has the services of designer Albin Grau and cinematographer Fritz Arno Wagner, both from NOSFERATU. 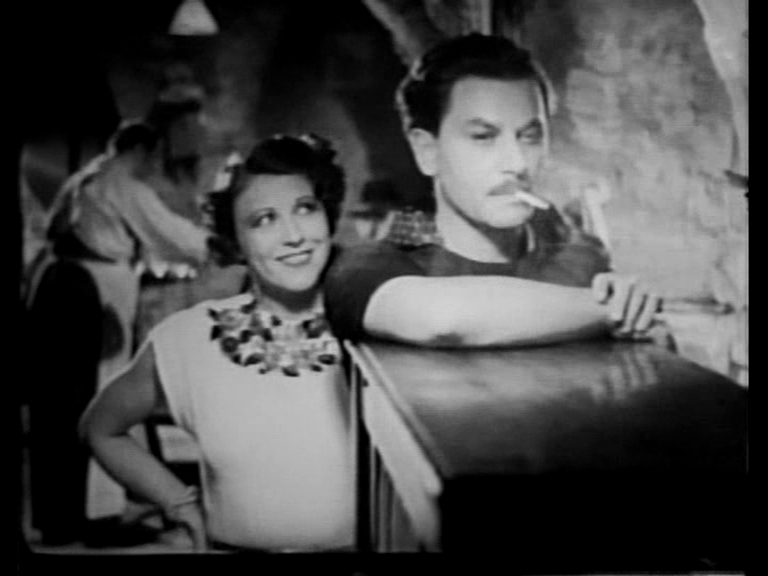 In WARNING SHADOWS, a tousled Fritz Kortner is tormented by homicidal jealousy regarding his wife, with her Grecian costume and strange, funnel-shaped hairdo. 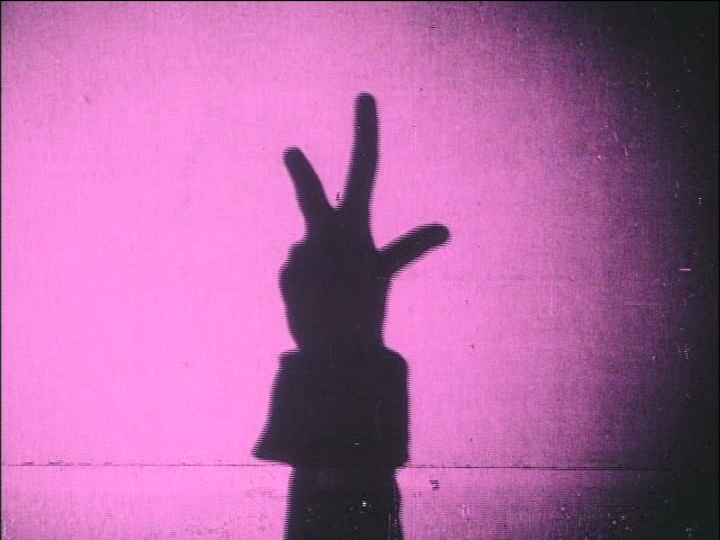 The arrival of a grimacing shadow-puppeteer leads to an extended revenge phantasie, making this the German expressionist version of UNFAITHFULLY YOURS (itself a screwball Othello). Fritz Rasp (the newly-restored Thin Man of METROPOLIS) plays a snide footman, his centre-parting extending right down to the back of his neck, a striking look in a film marked by tonsorial eccentricity from the off. 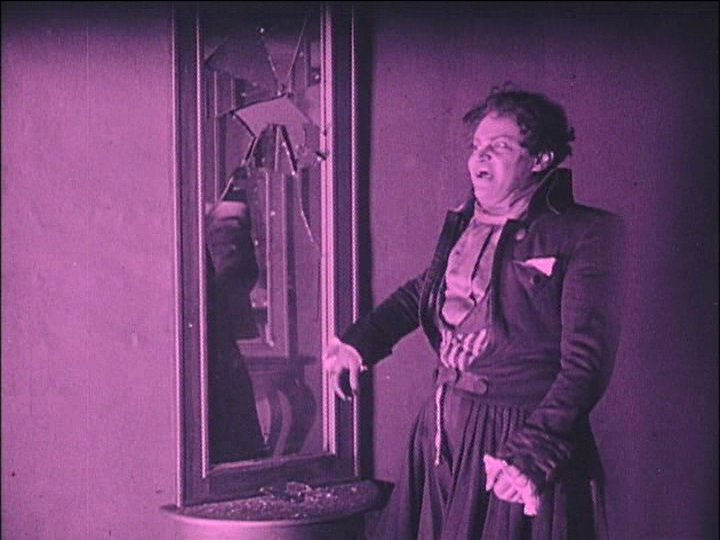 We also get Rudolph Klein-Rogge, and Alexander Granach (Knock, the Renfield character from NOSFER) is “the Shadowplayer” — a unique performance attained mainly by thrusting his arse out in an insolent fashion. I may have to make him my avatar. 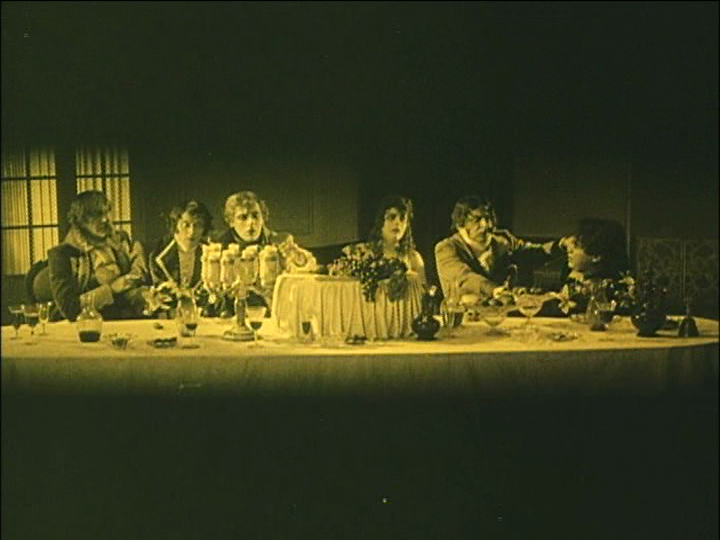 The cast is frozen in time in this Last Supper pose/composition, so that Granach can project an instructive shadowplay inside their dreaming minds — a metaphor for the cinema itself?